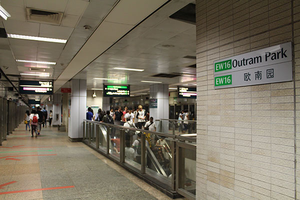 Outram Park (EW16/NE3/TE17) is an underground Mass Rapid Transit (MRT) station on the East West Line, the North East Line and the future Thomson–East Coast Line. A plaque relating the history of the Outram Park prison can be found outside of the station. The prison no longer exists as residential blocks (HDB) have been built where the prison once stood. On 15 March 2012, more than 117,000 commuters were affected during a peak hour train breakdown between Dhoby Ghaut and HarbourFront, caused by faulty overhead power cables at the tunnel of the Outram Park that had snapped. A second problem was discovered relating to electricity insulation, delaying the service further. Train services resumed at 4.35 pm after nearly 10 hours of disruption making it the third breakdown in 4 months. On 10 January 2013, train services in both directions on the North East Line was disrupted due to a power fault. At about 9.50 a.m., SBS Transit said no train service is available between HarbourFront and Outram Park. Train services fully resumed at 4.35 p.m. The North East Line sector of the station was the site of a rare police shooting incident, in which Lim Bock Song, 43, who had earlier fatally stabbed odd-job worker Tan Ah Chang at a coffeeshop at Jalan Kukoh, was shot by a police officer after threatening the officer with the knife on 6 March 2008 at 3:35 pm. Four platform screen doors in the direction of HarbourFront were affected due to the police cordon which lasted two hours and passengers had to use other doors to board and alight. However, train services were unaffected. The Commuters by Teo Eng Seng, can be found at the linkway between East West Line and North East Line platforms. The artwork depicts people in motion reflect the thoughts and inner-most feelings of commuters. These images seem to emerge from the wall and disappear into it, inviting commuters to pause and contemplate their meaning. Memories by Wang Lu Sheng, are placed at the entrances leading to North East Line part of the station. The artwork depicts the pageantry of Chinese opera and the symbols of law and medicine come together in this vibrant artwork that exults in Outram Park's unique heritage. 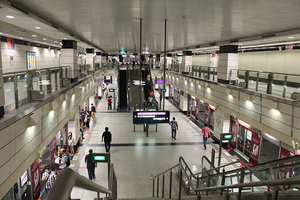 ↑ "NEL's Dhoby Ghaut – Habourfront service resumes". Channel NewsAsia. ↑ "Full train service on NEL resumed at 4:35 pm: SBS Transit". Yahoo! Singapore. Retrieved 15 March 2012. ↑ "Joint News Release by Land Transport Authority and SBS Transit – North East Line Train Service Resumes Full Operation Following Morning Disruption". Land Transport Authority. Retrieved 15 March 2012. ↑ "NEL service disrupted due to power fault". Channel NewsAsia. Retrieved 10 January 2013. ↑ "NEL services to fully resume at 4:30pm". Channel NewsAsia. Retrieved 10 January 2013. ↑ "NEL services fully resumed at 4:35pm: SBS Transit". Channel NewsAsia. Retrieved 10 January 2013. ↑ "43-year-old man shot by police at Outram Park MRT". Valerie Tan (Channel NewsAsia). Retrieved 6 March 2008.